My mother’s primary hobby, aside from grandmothering, is thrift shopping. She is a predator, in search of cheap prey. This always yielded a mother lode of good things for me when I was growing up. Clothes, toys, you name it, I had it and most of it came from thrift stores. In the last few years, she discovered what she named the “wild thrift shop”, which is the distribution hub for the Goodwill. At this particular thrift store, they roll in all the new deliveries in large, unsorted bins. Things are bought by the inch and by the pound. The quality and quantity of goods acquired from this place by my mother is tremendous. 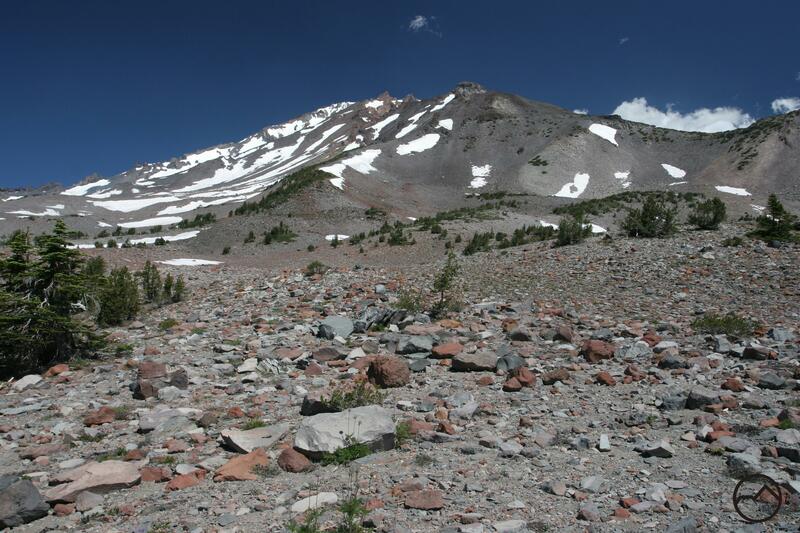 What do thrift stores have to do with Mount Shasta? Last week my parents came up to Mount Shasta to stay for a few days. 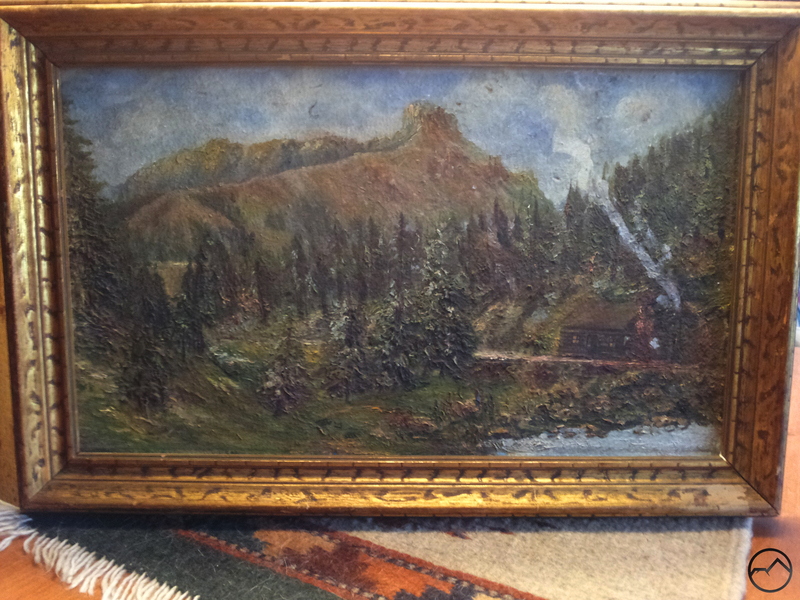 My mother brought with her a painting that she found at the “wild thrift shop” a few days earlier. The painting is obviously old, but it is not the most attractive work. At first glance, the mountain depicted does not look like Mount Shasta. What caught her eye was a printed label that identified the artist, E.S. 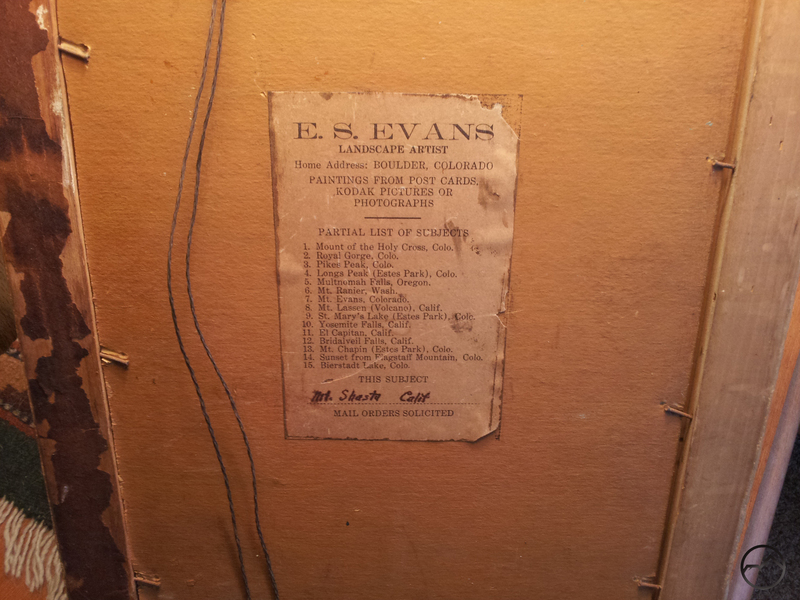 Evans, and listed a number of landscapes that he had painted. At the bottom of the list was a blank spot where the location could be written and “Mt. Shasta Calif” was hand printed in that spot. Despite its not looking anything like Mount Shasta she bought the painting and brought it up to my house. 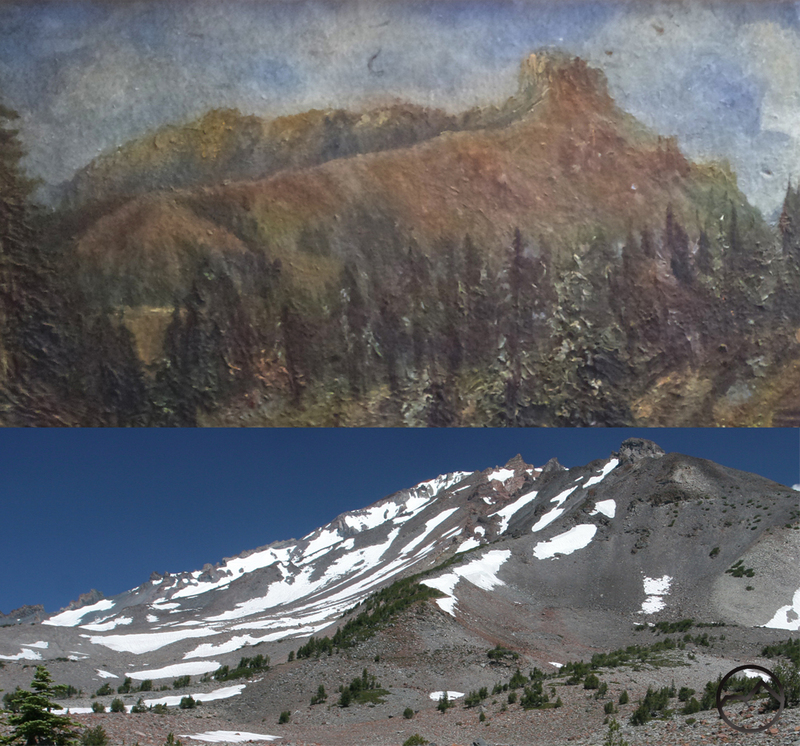 Just days before my parents arrived, I had been uploading pictures to Hikemtshasta and just happened to have uploaded an image that featured the great volcano from the same perspective as it was painted in the old picture. When I saw the picture I instantly recognized it for what it was. Rather than being a painting of Mount Shasta from somewhere down below or from a distance, it was a portrayal of the mountain from on the mountain. Specifically, it was the view from the top of Hummingbird Saddle, which is the divide between the Old Ski Bowl and the Valley of the Moon. In an act of artist’s license, the painter added far more trees than are actually present and included a cabin that may or may not have existed at that spot. The unusual angle, the trees and the cabin all contributed to obscuring the fact that is really was Mount Shasta. I was intrigued and wanted to know more about it. 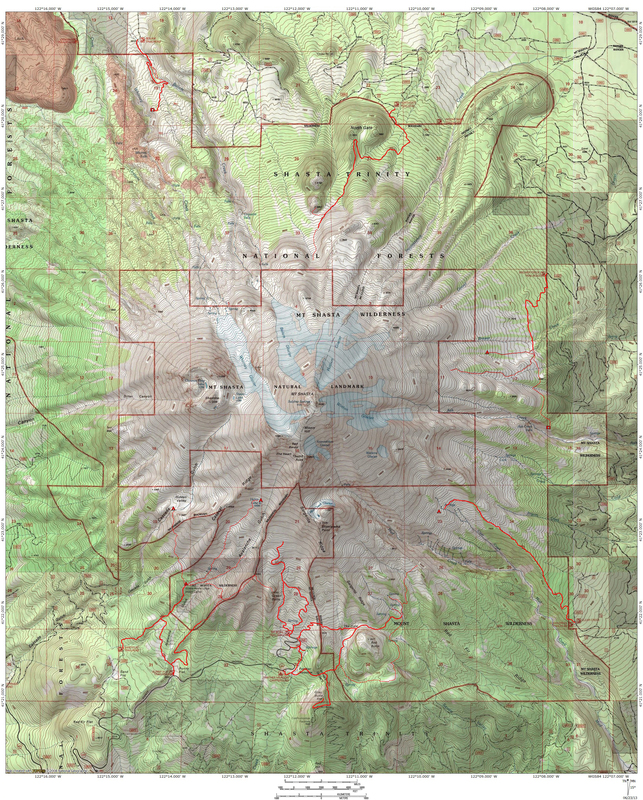 The obvious first place to go for information is the Sisson Museum in Mount Shasta. Unfortunately the museum is closed for the winter. On a whim, my dad and I went to the Forest Service to see if anyone there was keen on the art of Mount Shasta. Not surprisingly, there was no one there with the knowledge necessary to find out more about the painting. However, I was directed to the two gentlemen most knowledgeable on the subject, one the head of the Sisson Museum and the author of Sudden and Solitary, the definitive book on the art of Mount Shasta, and the other the recently retired head of the College of the Siskiyous Library. I spoke with the latter on the phone and they are both extremely curious about the painting. Of particular note to them is that depending on the paintings’ as yet undetermined age, it is possibly the oldest depiction of Mount Shasta from on the mountain. We agreed to meet and examine the painting together to try to determine the age. Since speaking with them, I noticed two bits of information that will help set the painting’s age. Both are found on the printed label on the back. First, there is a solicitation from the artist for paintings based on pictures or postcards. In particular, it mentions Kodak pictures. Since Kodak was founded in 1889, it can be no older than that. The second data point gleaned from the label is found in the list of subjects regularly painted by the artist, E.S. Evans. He was located in Boulder, Colorado, which is not far from Estes Park. Nowadays, Estes Park is the gateway community to Rocky Mountain National Park. The park was created in 1915. Several of the locations that are now in the park are listed as being in Estes Park. Many of them are pretty far from Estes Park and are in the heart of the mountains that now make up the national park. It seems likely that if the park had been created at the time of the painting was completed it would have indicated those locations were in the park rather than distant and generally unrelated Estes Park. I meet with the two gentlemen next week and we will work on dating the painting. I will write another post afterwards, detailing our findings. Part Two of my investigation of the painting can be read here. Great little detective project you have there. Good luck. I have found a painting on canvas of Siskiyou campground Camp 20 Mt. Shasta, painted and signed by an artist name Chestnut in 1975. do you have any information on this painting.